Hello dear readers! Monkey238 and I have returned from Origins 2012 a bit weary, but incredibly happy as we met many of you and made lots of new friends along the way. 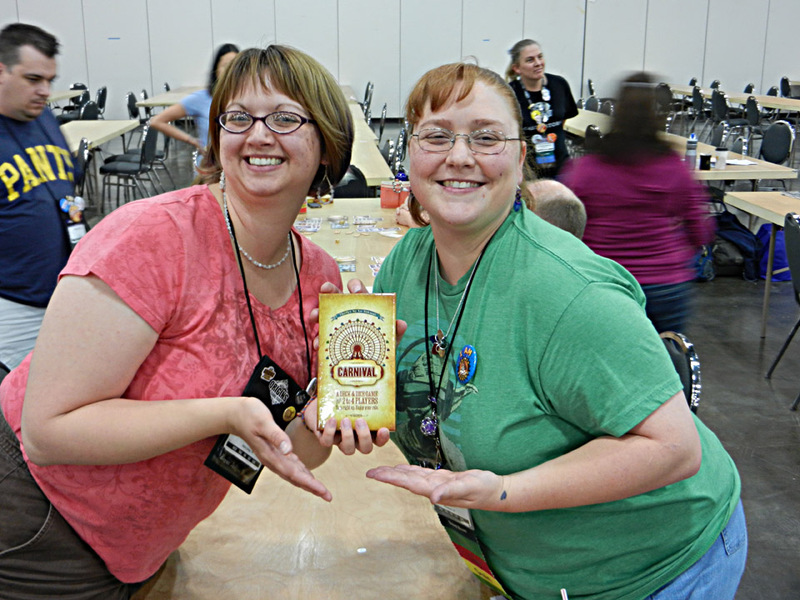 We worked hard from 10 to 6 every day in the Exhibition Hall running demos of Carnival, VivaJava and Compounded, teaching the joys of Lucky Dice (and awarding awesome prizes! 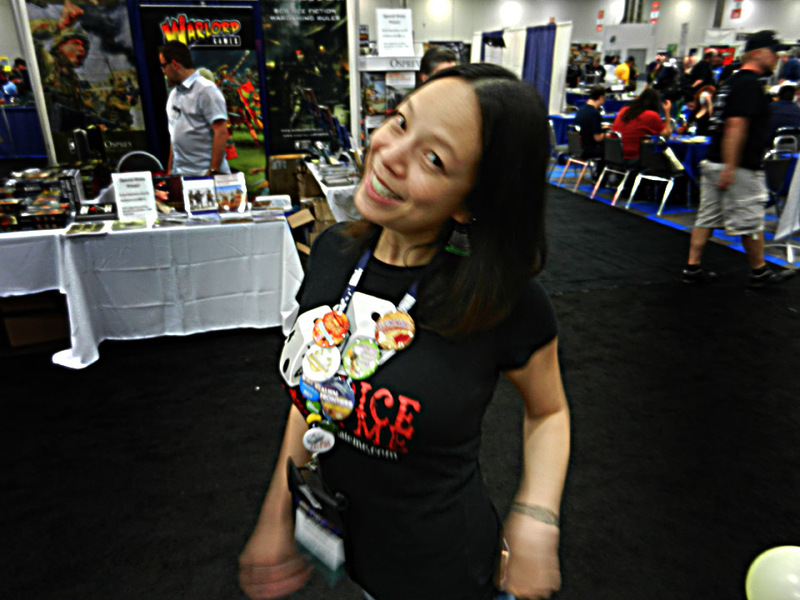 ), and just generally spreading the Dice Hate Me Games love around the con. 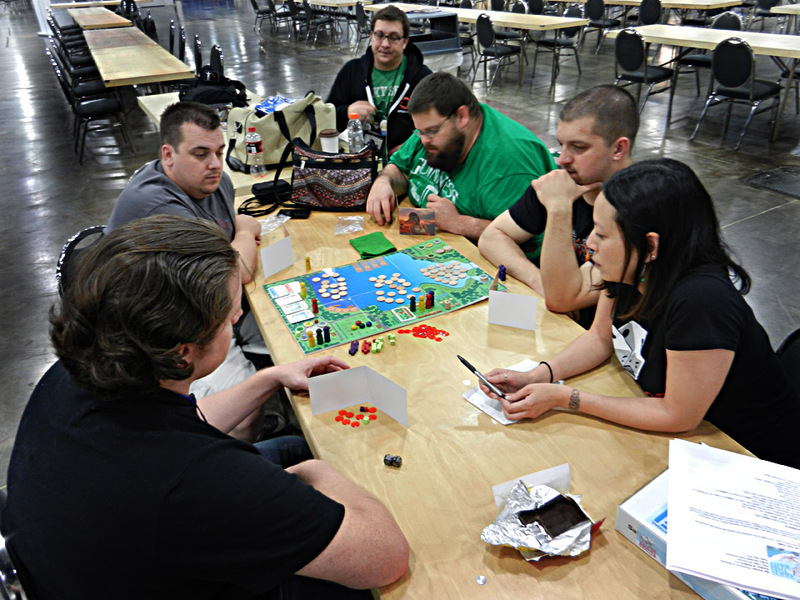 After the Exhibition Hall closed for the day, we also got a chance to do quite a bit of after-hours gaming with a great group of people in Cartrunk Entertainment’s Unpub area in open gaming. The easiest way to share our adventures is through pictures, so come on in and browse the action gallery! 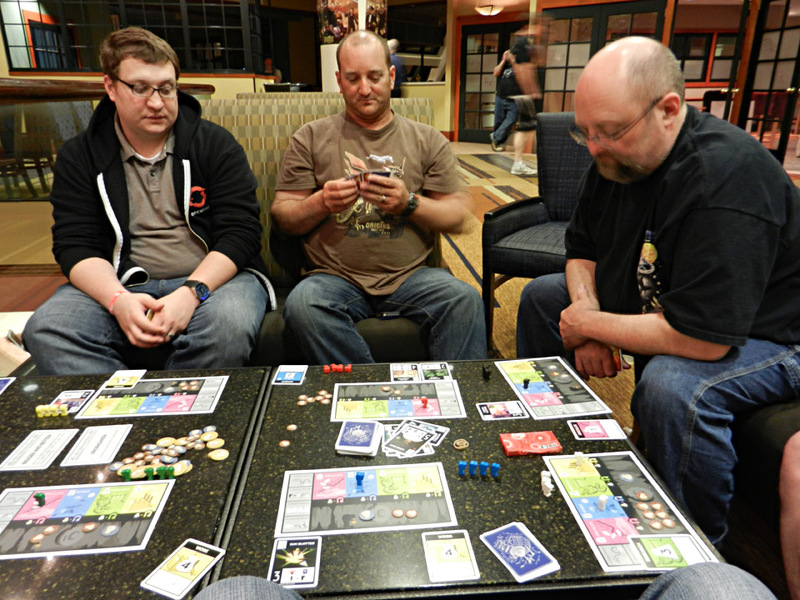 The calm before the storm; we gathered in the lounge of the Hyatt with (from left) Shawn Purtell, Fred MacKenzie and David MacKenzie to get a little devious in Nefarious. 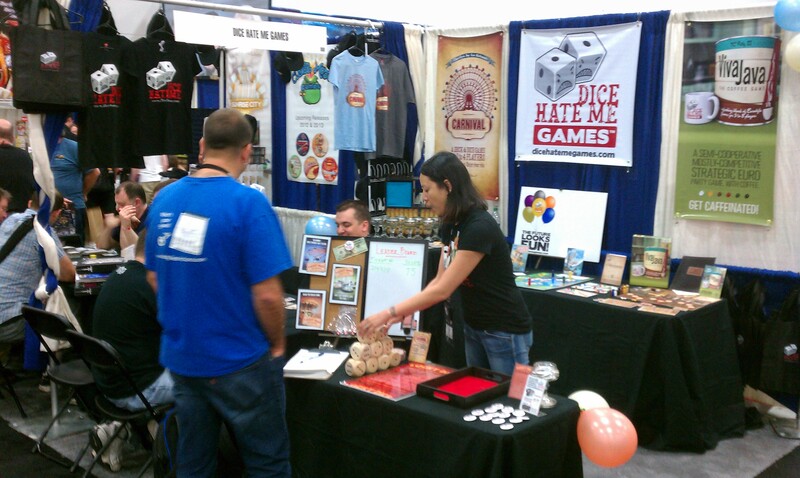 Our little home away from home at Origins - the Dice Hate Me Games booth! 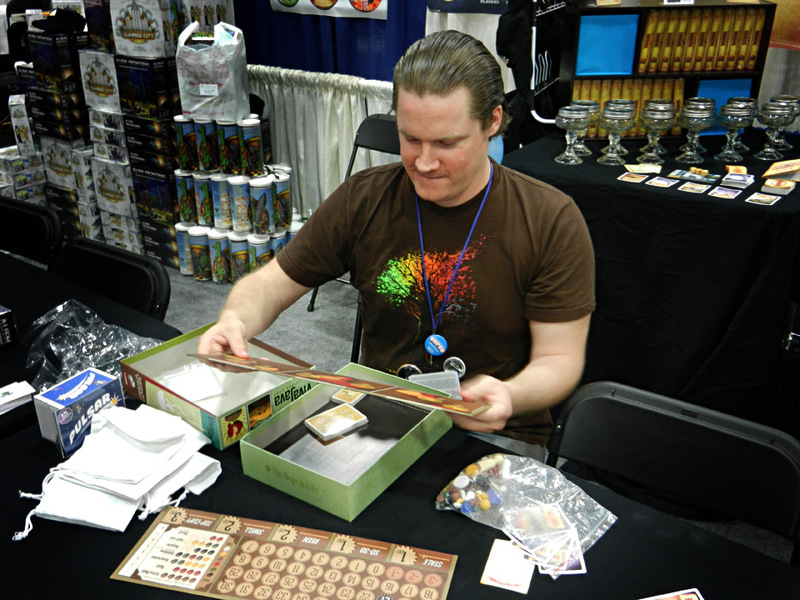 Our printer for VivaJava, Panda Game Manufacturing, managed to get us four advanced copies of VivaJava - here's designer TC Petty III elatedly unwrapping his box. TC admires the quality. And, believe me, Panda has done a superb job of making our art and design shine. A crowd gathers for the VivaJava grand unwrapping. Some after-hours gaming with the prototype of Awesome Possum by Fred MacKenzie. This game is awesome... possum! Fred is happy that we like his crazy game. 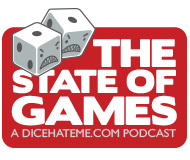 Some of you have heard us mention States After the Fall on The State of Games before. 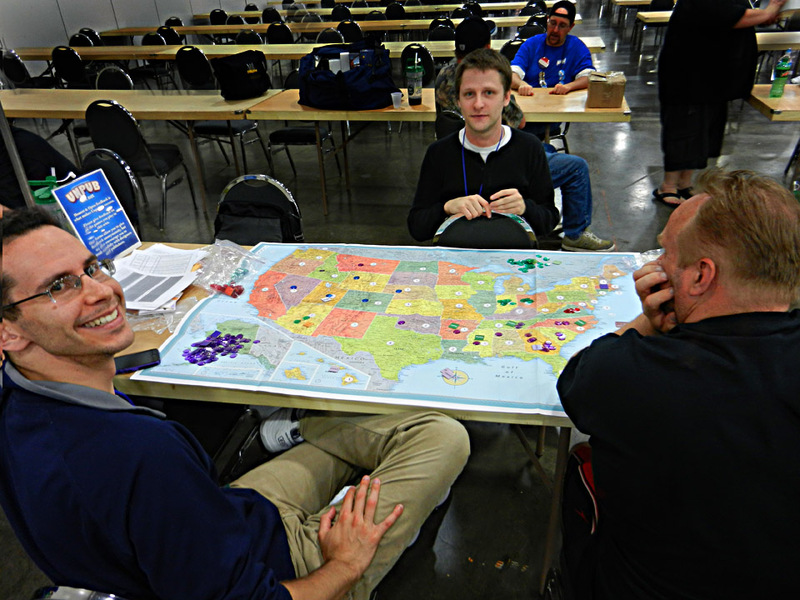 Here's Ben Rosset testing things out with States co-designer Aaron Winkler. 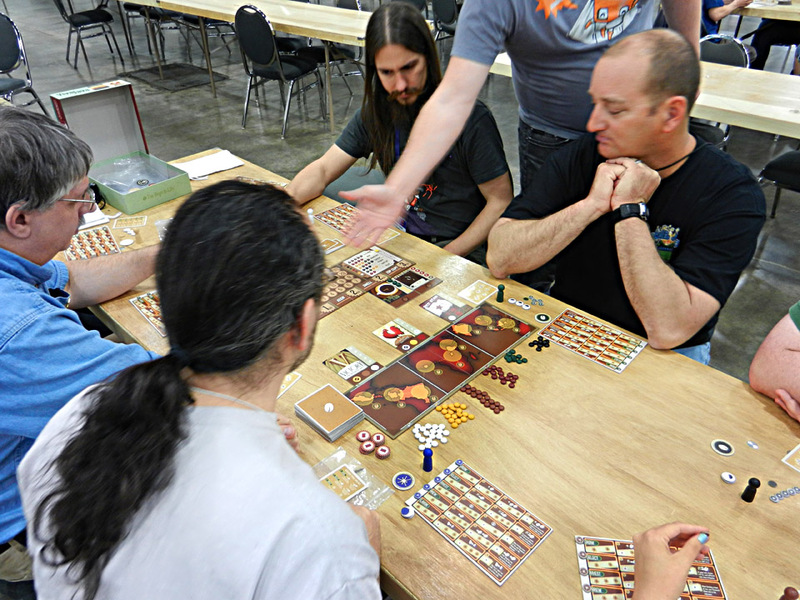 Here's (from left) Tim Hing, Luke Winters, TC Petty III and Darrell Louder trying out Forge from Clever Mojo Games while David MacKenzie (at right) looks on. There are lots of dice. LOTS of dice. Take the Bait! with TC Petty III, Darrell Louder, Luke Winters and Eric Leath. TC waits for his long-term plan to finally pan out while Darrell Louder continues to pull the big ones from Lake Wanapulachit. 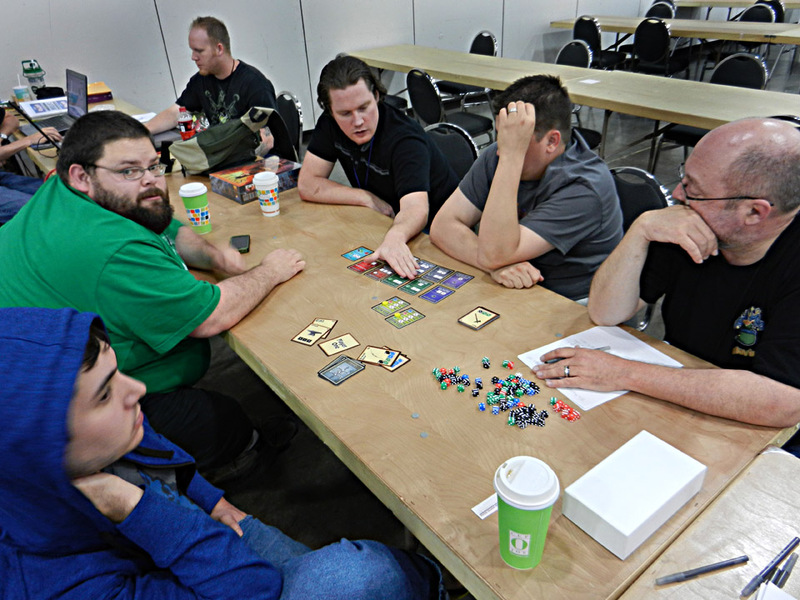 Steve Avery (at left), Walter Hunt, Luke Winters and Sentinels of the Multiverse creator Christopher Badell give team Carnival a try. 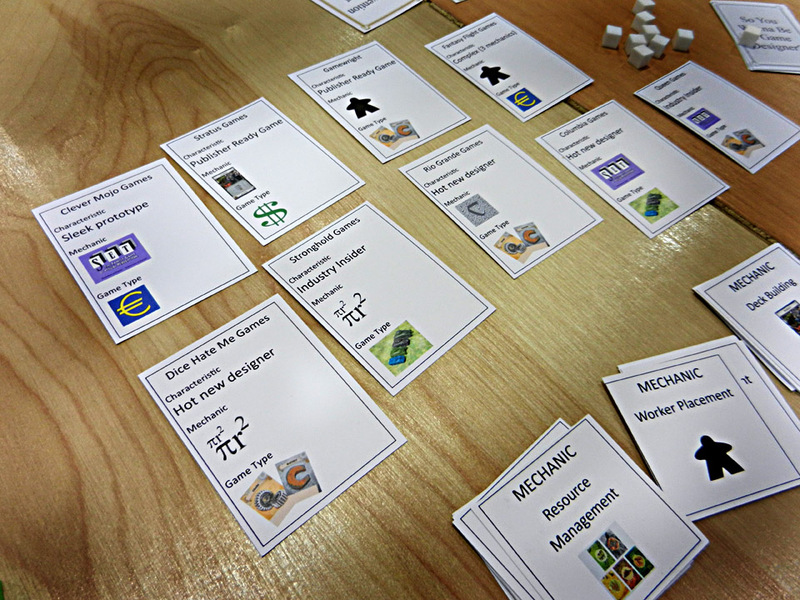 Six-player Titans of Industry with designer Brian Lewis. One of my favorite games from Clever Mojo - Swinging Jivecat Voodoo Lounge. Can't wait to own the final of this! 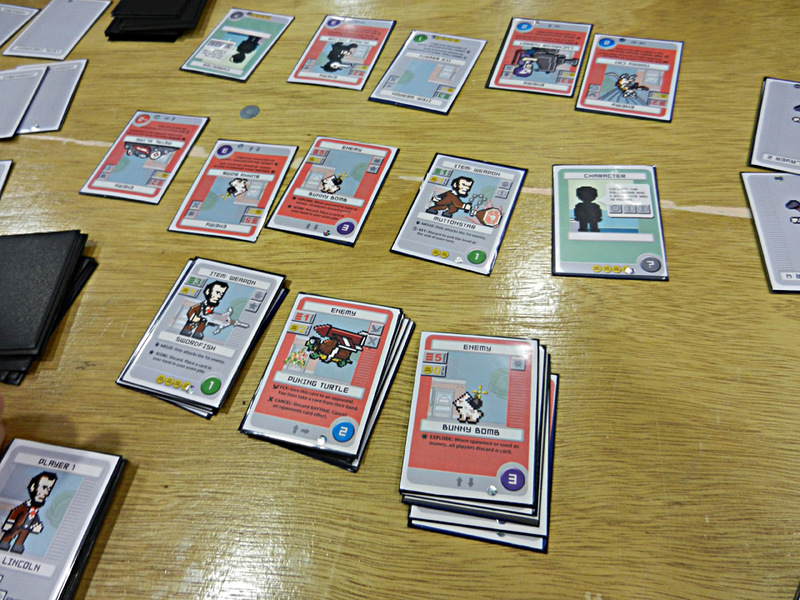 Jason Tagmire's side-scrolling deck-builder - Pixel Lincoln. Now available on Kickstarter! 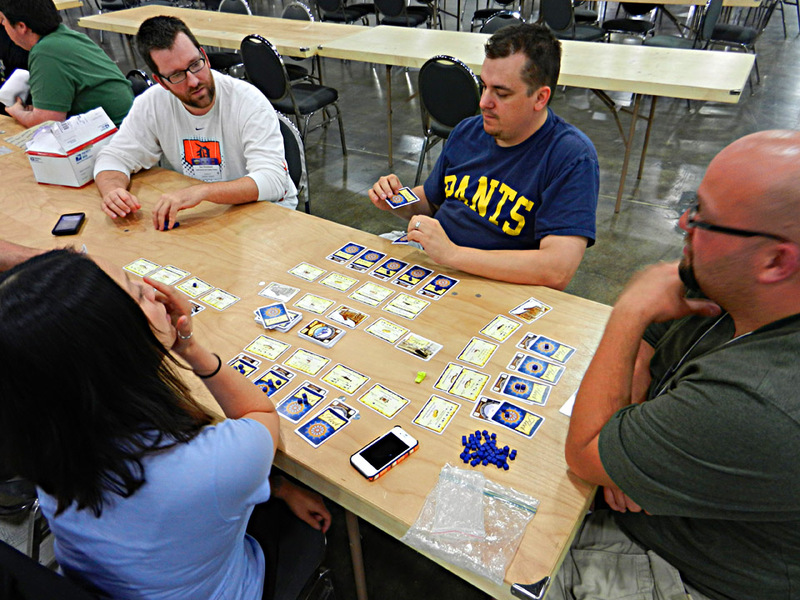 Darrell Louder gives designer Ben Rosset a little grief while we try out Ben's 10-player extravaganza "So You Wann Be a Game Designer?" Hey, look! I recognize that publisher from "So You Wanna Be a Game Designer?" 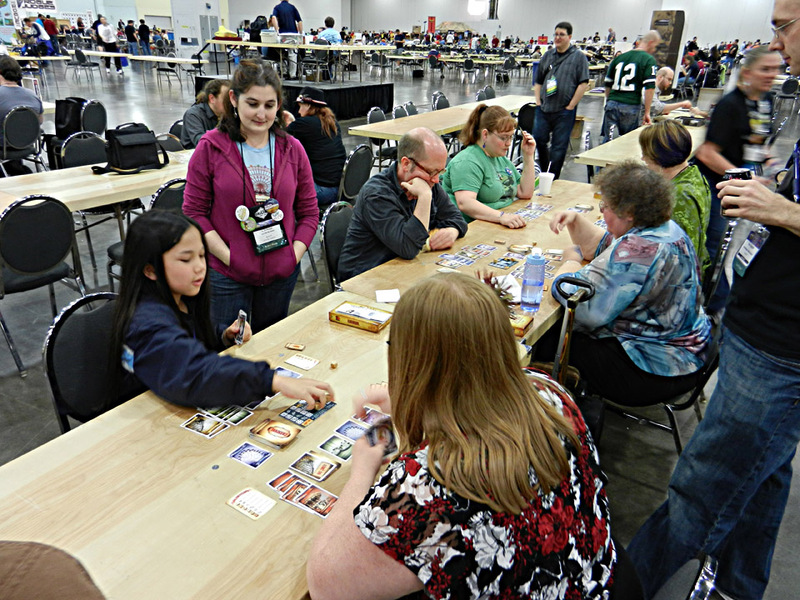 The Origins 2012 Carnival tournament! 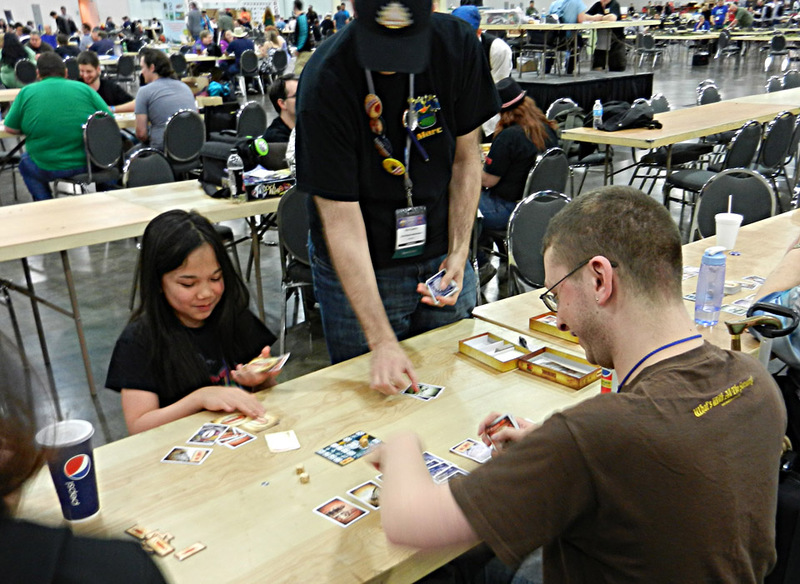 The heated first round of the Carnival tournament. The end of the most epic game of the tourney - a semi-final between Zach and his elusive (and crazy good) 11-year-old opponent. I'm not lying when I say it was the greatest game of Carnival I have ever witnessed. The final showdown between Zach and Debbie! 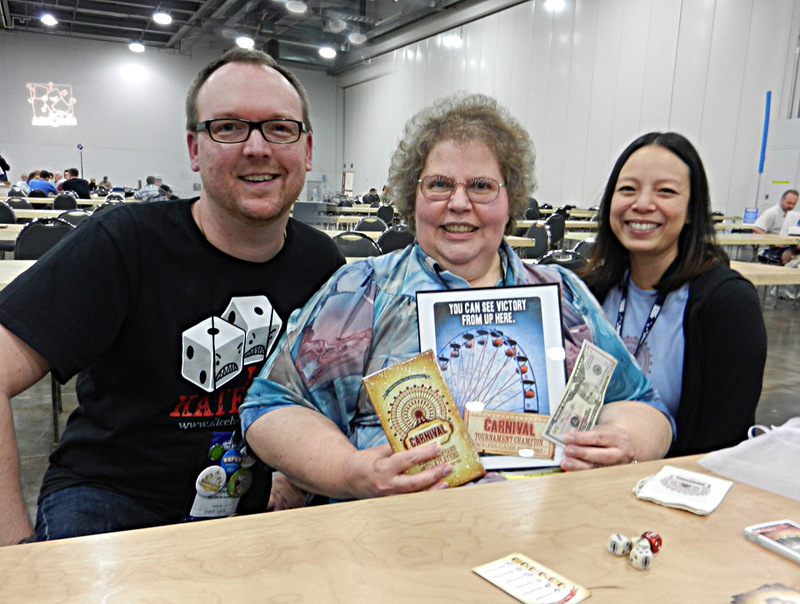 Our grand Carnival champion, Debbie, showing off her spoils of victory! 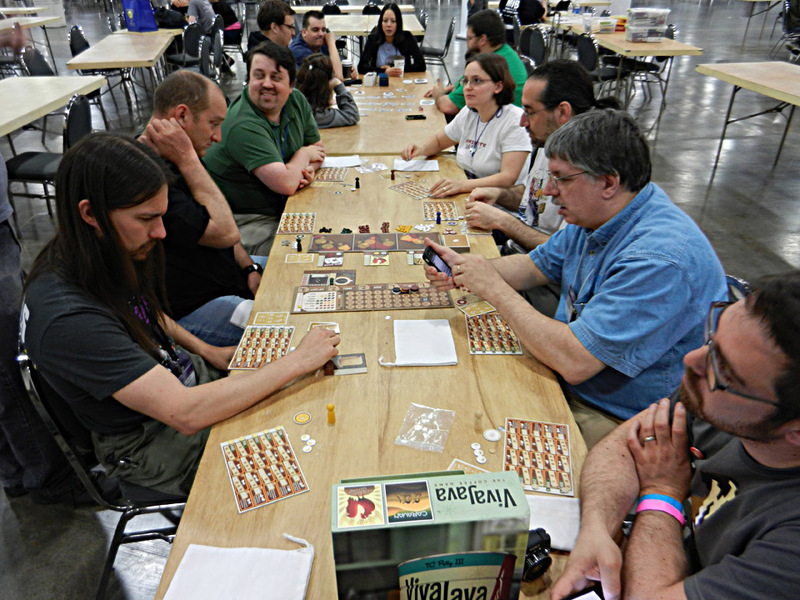 Late-night 8-player VivaJava with some industry insiders. TC teaches Christopher Badell of Greater Than Games and Fred MacKenzie of Clever Mojo Games the finer points of blending the perfect roast. 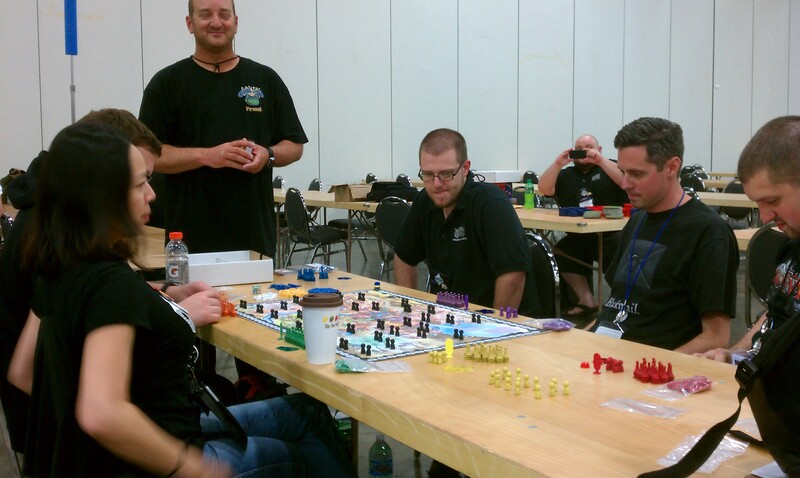 The highest Lucky Dice score of the convention - 100, by Chris Copac. 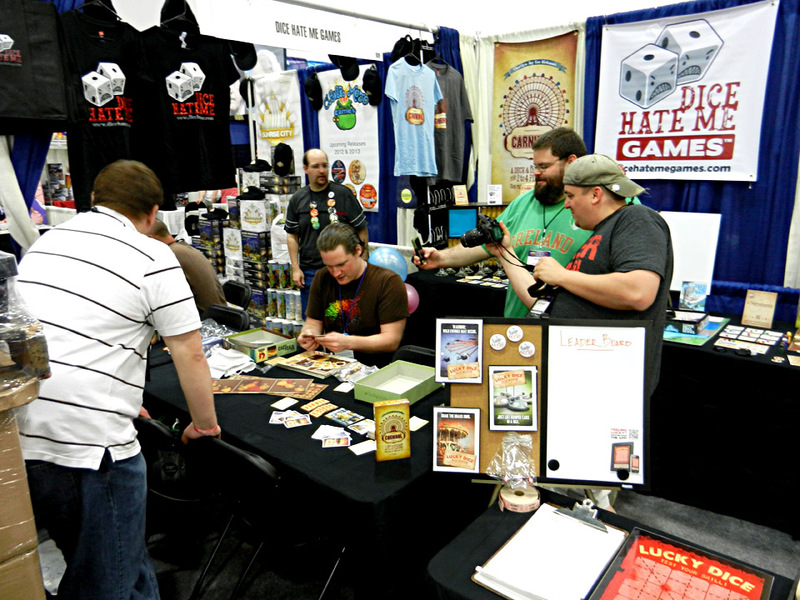 Come see us next year at Origins 2013! It was awesome getting to meet you guys! Very awesome show and can’t wait to see how much you’ve grown by next Origins! 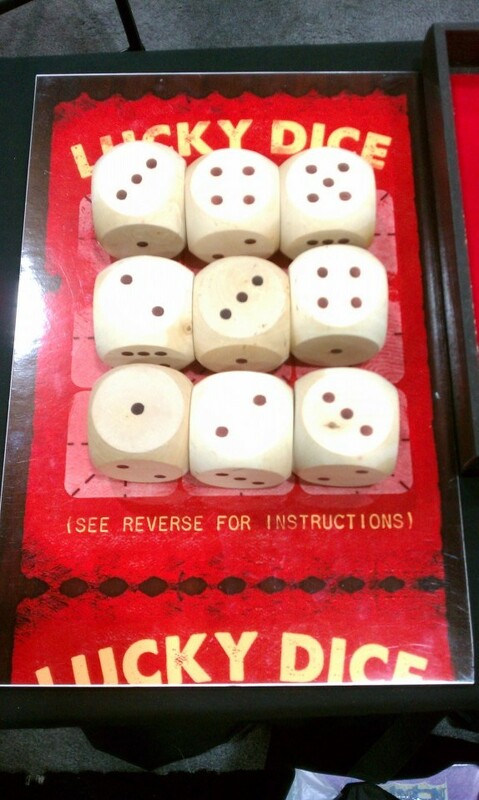 It was great meeting you guys and getting to try out Lucky Dice. I’ve played the heck out of that app and have yet to beat my high score of 80 from my first play at your booth. 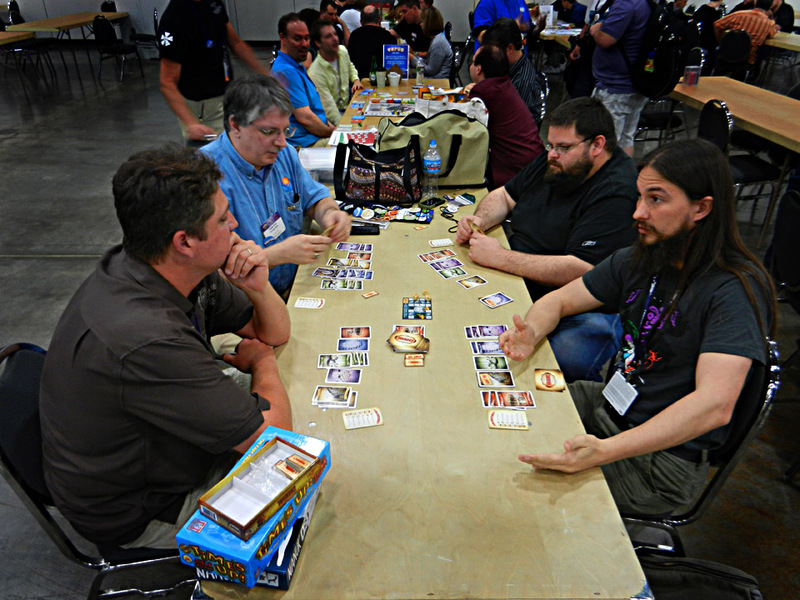 I look forward to seeing you again next year when you have even more games on hand and I have more than one day to spend at the Con. Thanks! Ken- It was great to meet you, too. If we stay on track, we’re going to need a bigger booth next year! 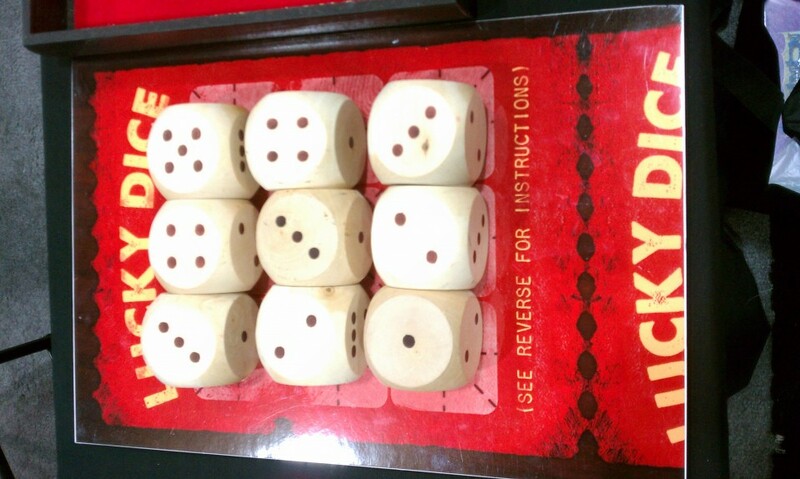 Tony – I’m glad to hear you’re playing the heck out of Lucky Dice. Let us know when you get that perfect 105. Nice rolling at the booth, and it was great to meet you. We’ll see you next year! 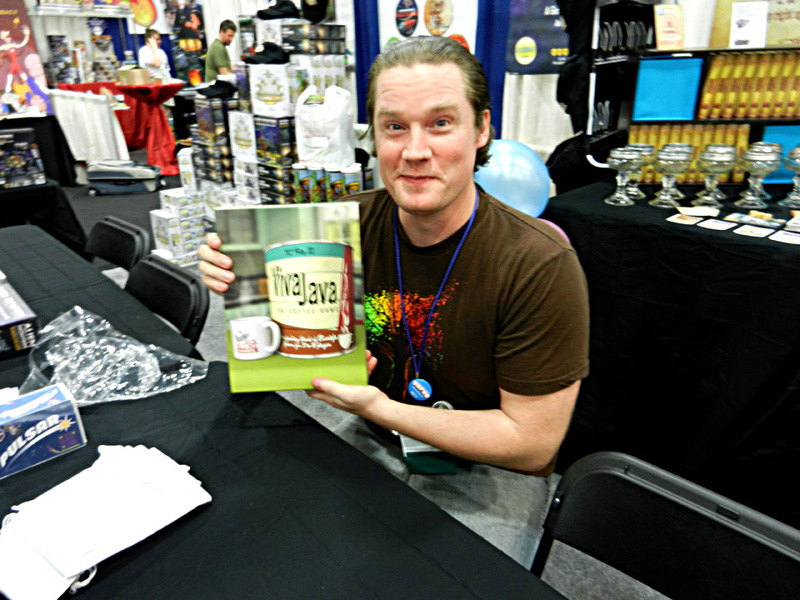 Wow, so cool to see TC Petty III opening a copy of Viva Java. And also cool to see the all excitement around the Carnival tournament. You guys are big time! Great time hangin out and meeting everyone. 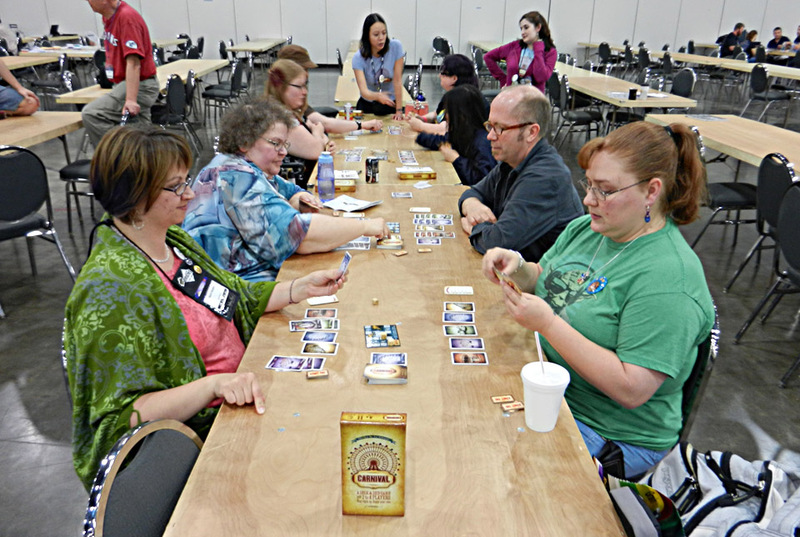 Loved Vivajave and playing Fleet with Cherilyn and Darrell (and Chris). This makes me even more sad I couldn’t make it. Looks like you guys had a blast though. I hope to see you at the WBC! Looks like a great time! 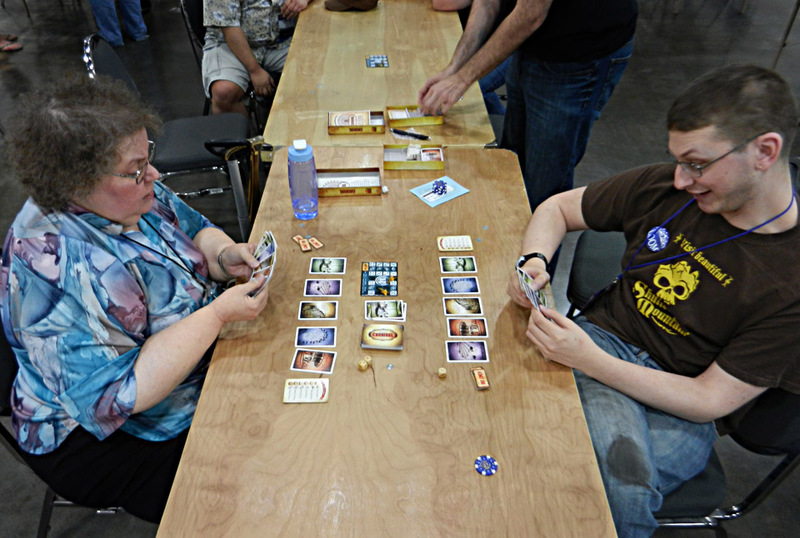 I didn’t get to go to Origins, wish I did. 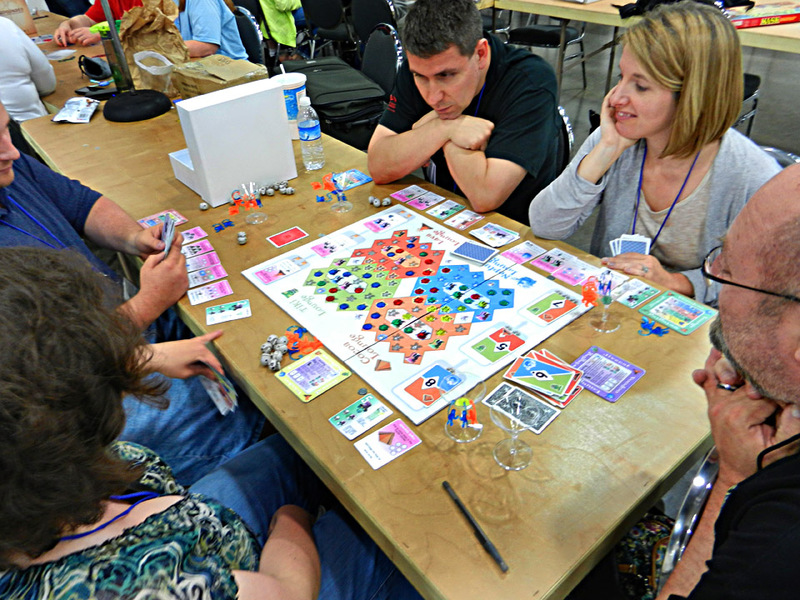 Will you guys be at Gencon? Would be cool to see you guys out in Indy. 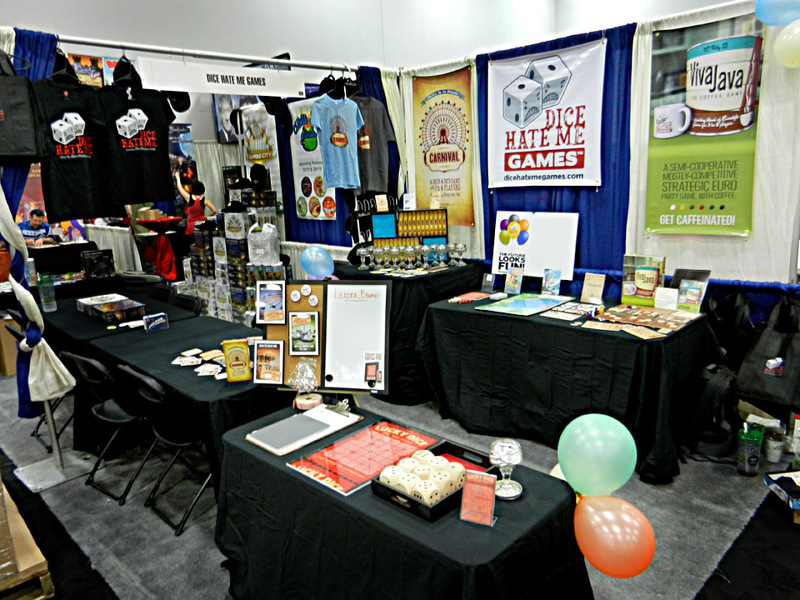 Congrats on a successful booth at Origins 2012! 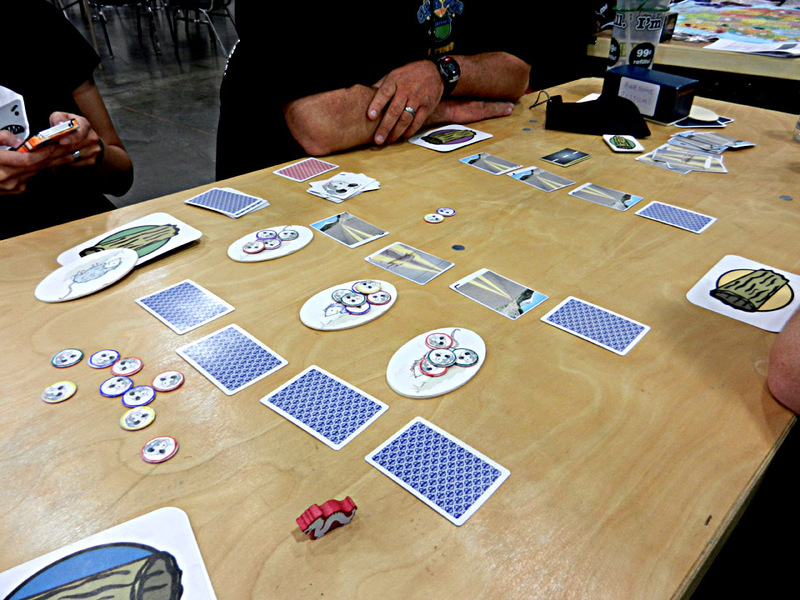 Carnival was the first new game I bought at Origins this year, and I love playing it. 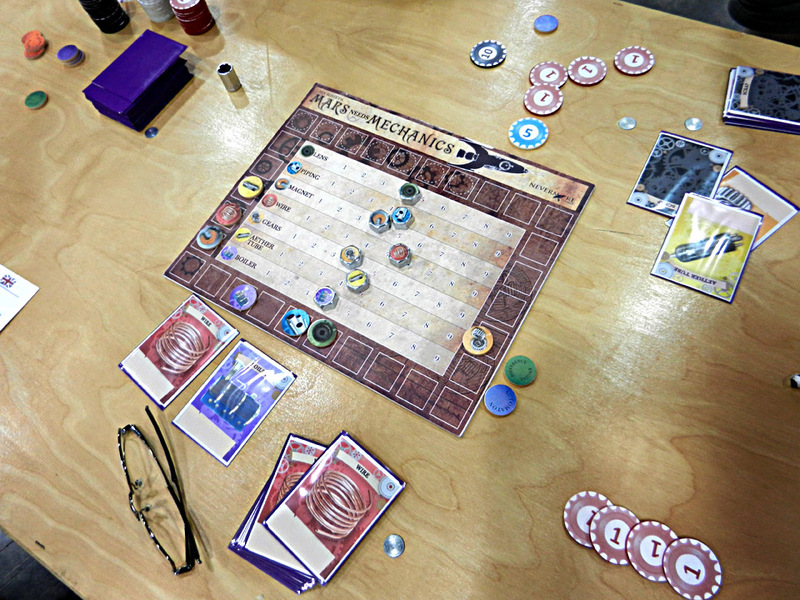 Everyone at your booth was very friendly and explained all the upcoming games very well — they are my most eagerly anticipated games so far, especially ‘Take the Bait’, ‘Viva Java’, and ‘Compounded’. 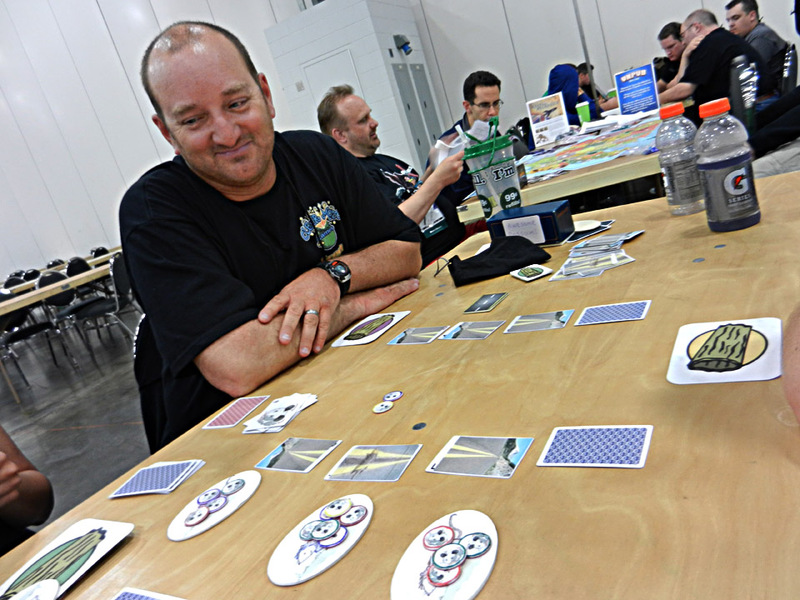 I hadn’t heard of ‘Awesome Possum’, but considering that my BGG handle is ‘a_flying_possum’, it sounds …well … awesome. Can’t wait! 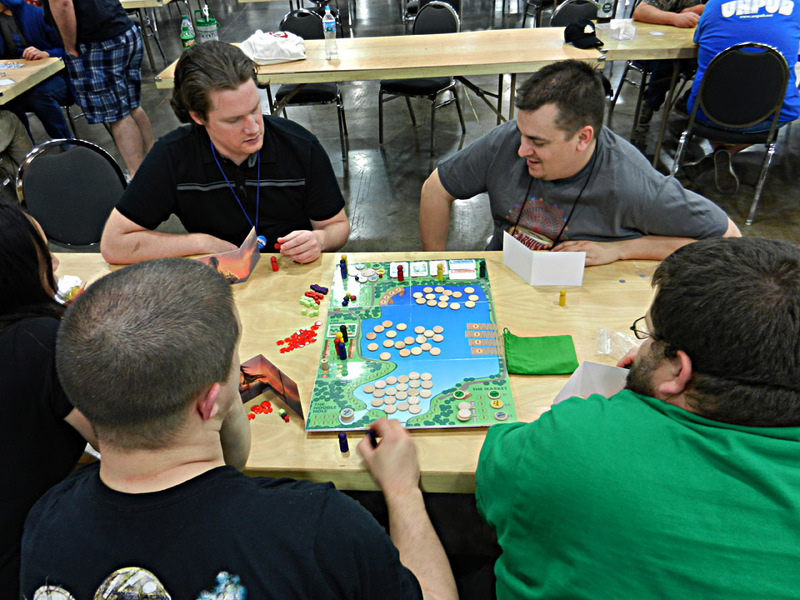 It was great to meet you all at Origins. 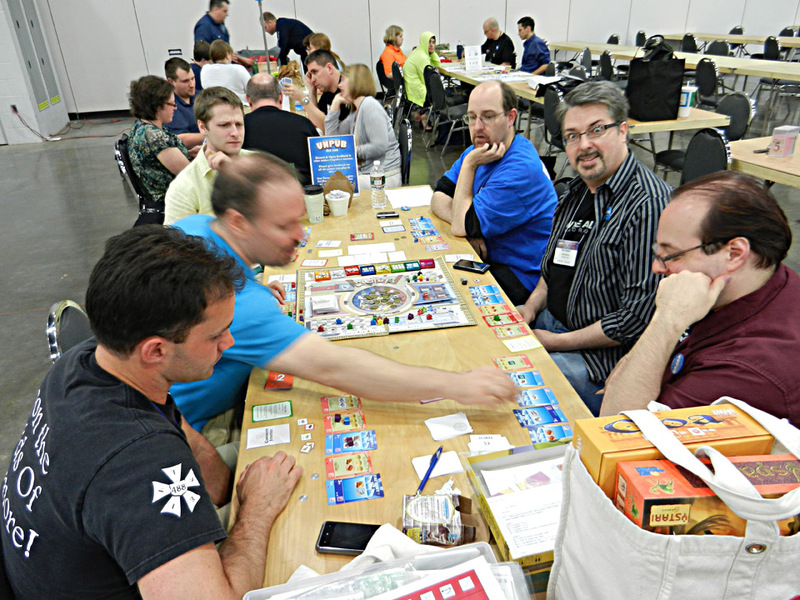 I don’t know if I qualify as an “industry insider”, but I did enjoy playing Carnival and VivaJava, and look forward to getting my copy of the latter to show off.